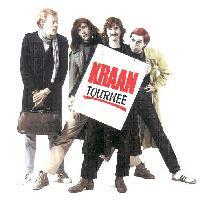 Kraan - "Kraan" / "Live" / "Tournee" / "Nachtfahrt"
A year ago, I complained about the lack of official Kraan CD reissues, and here we are now being flooded with them. Good deal. The big boys at EMI Electrola have gotten hold of the first five (1972-1975), the rest of the Kraan catalog going to the folks at Fünfundvierzig, with distribution here in the US by innerSpace Records in California. Only two of the early classics have appeared on the shelves so far, oddly the debut self-titled album, and the 'Live' double album which appeared fourth. But I can tell that EMI is doing everything up to 1975's 'Let It Out,' because they're putting small letters on the top of the spine that (once they're all released) will spell 'K R A A N' when placed correctly in your CD storage unit. (A not-so-subtle hint that you have to buy them all!) So we've got the 'K' and second 'A' represented here. They've done a nice job with the booklets too, jamming in lots of photos and clippings (albeit in German mainly) and bilingual text giving short histories of how the albums came about. A hell of a lot better than the old crappy Germanofon bootleg versions in any case. The 'Kraan' album is the classic work that I always knew it would be, given my love for its followup 'Wintrup' (the one Kraan CD I managed to find before this past year, albeit the bogus version). It is, however, not entirely similar in style. My feeling is that their earliest stuff here is more 'ethnic' and quite a bit more like the quirky, psychedelic madness of Amon Düül II. I'm sure that's true to a certain degree with 'Wintrup' as well, but I hadn't thought about the similarities so much until hearing this one. 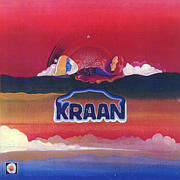 The difference is that the Kraan quartet were a tighter musical unit and more 'technically-oriented' in their compositions, if you will. Amon Düül II always seemed dangerous and loose in their approach, and occasionally went beyond the edge. (That's why I love them so.) The eclectic, disjointed 'riff' of "Sarah's Ritt durch der Schwarzwald" that opens the album is dangerous also, and Peter Wolbrandt's crazy psych-guitar leads (if you wish to call them that) top it off with much flair. Wolbrandt sings in German here, whereas he chose to do most of his singing on these early albums in English. The other main instrumental voice of early Kraan was saxophonist Johannes 'Alto' Pappert, and he provides the simple melody for the peculiar "M.C. Escher." The middle-eastern feel that this tune contains is even more developed in the instrumental piece "Kraan Arabia," my favorite work on their debut... a 10-minute smorgasbord of Hellmut Hattler's rumbly bass, multiple layers of percussion from Jan Fride, and the twin nasally sounds of sax and guitar playing the theme. As is evident throughout the 43-minute album, here the band uses excellent phasing effects on the drums and other instruments. The epic "Head" at over eighteen minutes is actually not a run-on song but more like many songs in one, and features a number of excellent passages. Fride's drumming is impressive throughout, and although the jazzy style (that Kraan further refined) is present here, the overall impression on "Head" is one of 'avant-garde jam rock.' The short and dreamy "Sarah auf der Genseweis" wraps up things nicely. Ostensibly, four bonus tracks are included (splicing on another thirty minutes), but these are really just demo versions of tracks on the album itself, and so not really a necessary thing. But then, the space is there on the disc... so what the hell? Originally a double-vinyl product, 'Live' is a high-quality recording (on 16 tracks, engineered by the legendary Conny Plank) of a single October, 1974 show at the Quatier Latin in Berlin. The CD version manages to jam all nine tracks and 78 minutes onto a single disc, and saves us a bit of dough. Wolbrandt and Hattler have their usual good time pulling out all the stops, putting an extra touch on their repertoire of peculiar syncopated rhythms. "Holiday am Marterhorn" (including "Gipfelsturm") is the album's high point, the opening "One of These Days" style bass riff giving way to cool phased-guitar droning and Pappert's fine sax melody. Complex and tuneful at once. Versions of "Sarah's Ritt..." and "Kraan Arabia" from the self-titled album are both performed well and are rather faithful to the originals. On the contrary, the four-piece use "Nam Nam" and "Hello Ja Ja, I Don't Know" as two works to really stretch out and play with the audience. Always the joker, Wolbrandt uses the former to show off his 'Flight of the Bumblebee'-like playing on guitar, on the latter singing the lyrics (in English now) in a particularly mocking tone. The title track from 'Andy Nogger' has a surprisingly southern rock flair, á la Lynyrd Skynyrd, though sprinkled with a number of cosmic effects. It's obvious that Kraan had a fun time at this gig, and we are lucky to have this performance so well archived. We skip ahead now to the late 70s for another live album, this one comprised of four different performances in late 1979, but only of single LP length. Wolbrandt and Hattler were still heading up this lineup of Kraan, with keyboardist Ingo Bischof and drummer Udo Dahmen also on board. Stylistically, 'Tournee' is very similar to the two preceding studio works already released on Fünfundvierzig, 'Wiederhren' and 'Flyday.' Cheerful, upbeat jazzy-rock was the flavor of the day, and Kraan's version was respectable if not earth-shattering. 'Tournee' is an even mix of the energetic funky-jazz type and the stylish 'cigarette lighter' ballad type. Bischof's keyboard textures are less obvious than Wolbrandt's guitar antics, but no less important to the overall sound of this edition of Kraan. The instrumental "Almrausch" (a non-studio track it seems) is a winner, the screaming guitar solo a wake-up call following the subtle synth passages. "Yaqui Yagua" from 'Wiederhren' is redone here very nicely, with a pair of dreamy ambient segments and a number of meter changes. Overall, though, 'Tournee' is a rather unnecessary archive as the band really didn't offer anything that we didn't already hear on the studio works. 'Nachtfahrt' is another story. By 1982, the music world had changed and the progressive ideas of the 70s were all but forgotten (only then to be reborn step-by-step over the next decade). 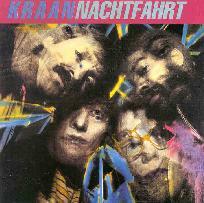 The members of Kraan had obviously been listening to what was hot at the time, and 'Nachtfahrt' sounds remarkably like the post-punk reggae rock of The Clash and even moreso The Police. With some of Wolbrandt's lyrics still in German ("Viel zu Hei"an unlikely reggae track title), a rather unusual cultural mix! "Luna Park" is the best of the lot, an excellent dubbish bass loop countered by an interplay of down 'n' dirty riffing and atmospheric synths. "Wintruper Echo" is another high point, this one relying on a motorik beat very much like classic Neu! The instrumental title track is a hold-over from the late 70s jazz-rock style, but it's nicely done as well. Impressive drumming from newcomer Gerry Brown on this one. The misses are BIG misses though. "Faust 2000" is weird, new wave rubbish. Like Peter Gabriel on a really bad day. "Paper Stars" is poppy and mundane also, and uses the dreaded handclaps-as-percussion technique. Ick! But considering the state of affairs in 1982, and having heard some contemporary Grobschnitt works (Wow, there was some awful stuff! ), I'd have to say that 'Nachtfahrt' was remarkably creative and enjoyable, despite the imperfect results. This one and the self-titled 'Kraan' are the two I'd recommend first from this bunch of four. More to come! There's very informative Kraan web site at: http://www.danbbs.dk/~m-bohn/kraan/. 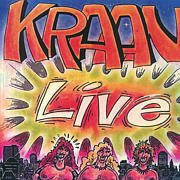 Kraan and Live are distributed by EMI Electrola. You can visit their web site. Tournee and Nachtfahrt are released by Fünfundvierzig. Contact via snail mail at Schmiedetwiete 6, 23898 Labenz, Germany. They are distributed in the US by innerSPACE Records. You can visit their web site.